I do a lot of my writing in coffee shops. And to coffee in general. This here to the right is not my coffee shop. 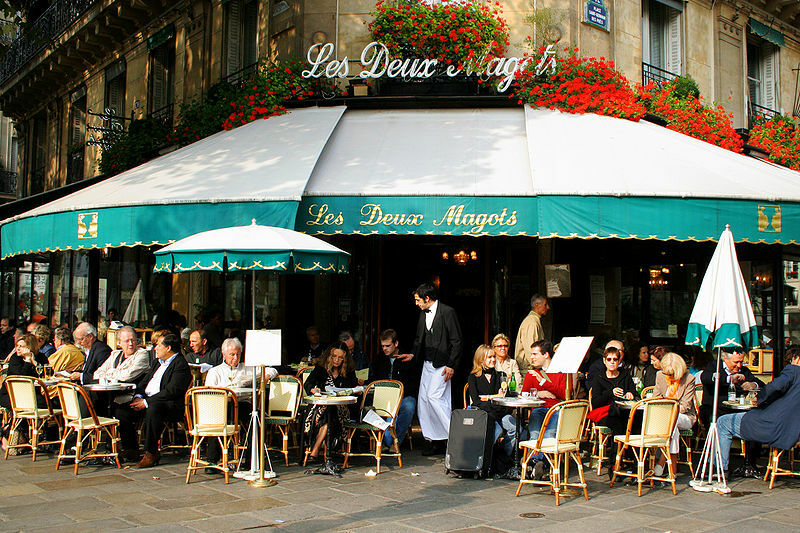 This is Les Deux Magots which is in Paris, and where Simone de Beauvoir, Jean-Paul Sartre, Ernest Hemingway, Albert Camus and Pablo Picasso hung out. They probably drank coffee there. Though I may be fooling myself and they may have just drunk absinthe and brandy and got plastered. My own coffee shop is in Virginia, but the principle is the same. Except for the possibility of getting plastered with attentive waiters and croissants and the literati of Paris as company. 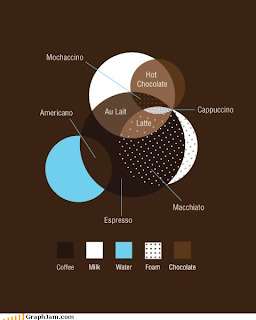 Here's my coffee shop menu of coffees. You can see we are all extensive and international and sophisticated. It's pretty good coffee though. And the baristas have piercings, which makes it authentic. This is the sofa where I hang out . . . see my computer, hanging out, and that there on the floor is the bag I carry the computer around in. This is my coffee shop coffee, which I drink in the morning. It smiles at me. But I also like tea. Here is my coffee shop tea, which is what I get in the afternoon, so I will be able to sleep at night. 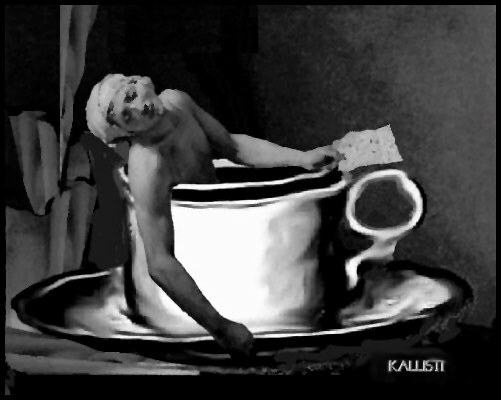 I will not say my conscience is entirely clear, but mostly it is having too much caffeine that keeps me up at night, rather than regrets for a misspent youth in the tenor of, 'and yet I could accuse me of such things,' though there is some of that too. My tea comes in a very heavy iron pot with a very heavy iron cup. I think they are enameled and this is authentic Chinese tea drinking in which I indulge. The electronics that surround me are much smarter than I am. Sometimes my food and drink is smarter as well. This is the other place I write. The library. I don't know why I go there to write since they don't buy my books. I do not drink coffee, tea, strong liquor, or indeed anything at all at the library. They do not allow WATER in the library. Maybe they think we will get into food fights or something. The parking lot of the library is particularly lovely. The interior of the library, however, is like every other library nowadays. Why do all libraries look alike? For instance. Here is a picture of the Bullock Fire Department in Bullock, North Carolina. What we have here is some individuality. If libraries would serve coffee, we would all be better off. I don't write anywhere but at home, but I do drink coffee in the morning and tea in the afternoon and I WOULD set foot in a coffee shop called Shenandoah Joe. Ah the gold couch. I love it when they've been roasting. I walk out of SJ and my hair smells like coffee. I had a glass of l'eau avec syrup at Les Deux Magots once. It was 6 euro! For a glass of water, basically. You pay a lot for the privilege of drinking where a bunch of drunk Bohemians used to drink, let me tell you. Shenadoah Joe's looks like a great place to hang out - better than the library. By the way my library (Jacksonville, FL) has 34 copies of your books - 32 of which are checked out now. But of course, I have all 5 of your books, including HLC. Thanks for all the wonderful characters and the hours of enjoyment. Shenandoah Joe was apparently a wholesale coffee roastery and seller before it started serving coffee. Most of the big warehouse like space they are in is given over to roasting and filling up BIG bags of coffee that they sell to -- I dunnoh -- folks who use up kilos and kilos of coffee. I find it hard to write at home because the floors keep asking to be washed. And then there's the laundry and dishes . . . I am unutterably jealous of your library. Coffee. How wise and sensible of them. Don't they know that coffee was first used by contemplative monks to allow them to stay alert during meditation? How suitable to a library's purposes. The trick is to find someplace that's not going to put the sun in your eyes when you're working. They are very patient with me there. I'm going to have to convince them to stock a good peppermint tea. I have seen the outside of the place but, like you, objected to the prices. Thank you so much for enjoying the books. You are very kind to say so. I'm glad you have HLC and hope you didn't get soaked buying it. I expect it to be out in e-book form pretty soon now. Let express great respect for the Jacksonville Library System. Obviously they are folks of taste and refinement. 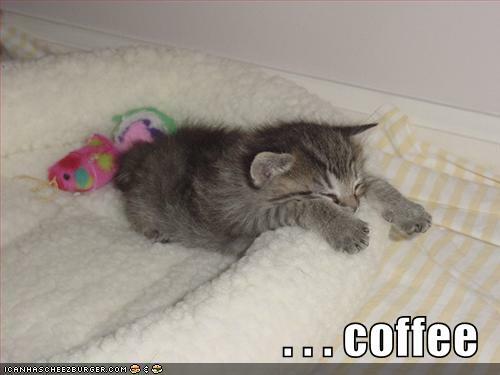 I do, however, drink coffee by the bucketload and couldn't get through a day without. Can't even think til I've had that first cup of coffee in the morning. 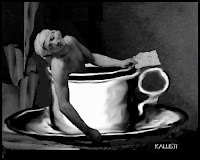 I particularly love the pic of your loving cup of coffee. Very cute. Like a java hug. I'm a big fan of Cinnamon Dolce Latte at Starbucks, but a coffee and baileys will always go down well. I love writing at coffee houses. No idea why. Maybe I should go today. Good plan. Thanks, Jo. I'm not addicted to coffee. We're just very very good friends. Coffee shops have just the right combination of quiet and background noise. Handing over coffee from time to time is a real plus. Our libraries carry your books. In fact, I frequently put them on my "Staff Picks" shelf. One of our branches also serves coffee and whatnot. I'm not sure if I'd like that at our little branch or not. We'd probably be dealing with throwing out old coffee cups around the public computers, just like we have to pick up the paper. It is quite a nice small town. I was stopped there, trying to decide whether my rear left tire was indeed going flat. It wasn't. But I snapped a shot of the fire station. This small town was doubtless founded by one of your distant relatives. Now there is a worthy project -- the coffee of Italy. There is nothing better than good non-fiction. I know a small amount about the history and brewing of coffee out in the Middle East, but almost nothing about Italian coffee -- except that Starbucks' founder was a huge fan of the Italian style coffee bar. Thank you so much for recommending my books. I love libraries. I have to admit I had not properly considered the extra work beverages make for the library staff . . . It does seem unfair such an obvious benefit should have a downside too. I also get distracted and start thinking too much when I try to write at home. I just wish my wonderful coffee shop (Muddy Waters) didn't have WiFi. On my work-at-home days (the work folks pay me to do), I head to the library. It's amazing how attractive cleaning the bathroom is when you're working. Plus my cats won't leave me alone. Ah coffee, couldn't beat the kids out of bed and get up at 5:00 a.m. to sneak some writing time without it. I'm a little jealous of the coffee shop, though. I live 60 miles away from a good one. I love coffee. Specifically lattes. Oooh... so yummy. I had a dream a couple of years ago that I, er, approached you for an autograph in your coffee shop. This might have been around the time DH and I were driving in the Blue Ridge mountain area. I remember when I was in college and used to have examines. I swear, I'd rather sort my socks by color than study for exams. I'm in a foreign students dorm, (here in Paris,) and got up early to have coffee in the cooperative cafeteria. Only in Paris would the coffee in the coop be splendid. Had a long talk with the Portuguese woman who ran the place, even though we don't really share a language. Walked around the Marais, this morning. I don't know quite where I'm going to put my villain's headquarters, or how the H&H find it ... but it will be in the Marais. I think there's an ordinance in Virginia that no place can be more than 5 miles from a Starbucks. I used to go to Starbucks pretty often. Then they decided they'd get rid of the cushy, comfy chairs that were making people come and sit there all day and put in uncomfortable chairs that make folks move on. I don't know how that policy works out in urban settings. In a small town, it's keeping the indie cafes in business. You should have told me when you were in my neck of the woods and I would have driven over to say hello. I like the absinthe flavor -- it's Pernod sorta. I keep telling myself I'll write a post on absinthe drinking over at Word Wenches -- even though it's after the Regency period. I live in Melbourne which I am quite sure is the coffee capital of Australia. I LOVE coffee and in Melbourne there is a coffee shop on every corner, sometimes two :) we are quite spoilt for choice. There are fabulous little laneways in Melbourne city centre which are jammed full of coffee shops, cafes, restaurants and chocolate shops which have squeezed themselves into every available nook and cranny. Our local library here has your books as well, which is where I first came across SML, but no coffee. Somehow I never associate Melbourne with coffee shops -- not the way I do Seattle. Am I assuming coffee goes with gray skies and rain? I shouldn't. The modern concept of the cafe is Italian, I think, and Italy has the most beautiful clear light everywhere. I'm so glad the books are in the library. I know they're a little harder to find and more expensive than in the States so I'm glad you can get to read them at the library. Yes, Melbourne is a city of many many coffee shops :) I actually grew up in the UK and lived in Ireland for years and I drink more coffee here than I ever did back there in the wind and rain :) Melbourne also prides itself on being a place where they get four seasons in one day, it can be 32 degrees one day and 18 and raining the next, depending on whether the weather is coming in off the sea, or coming down from the north. The wind that comes down from the centre can be unbelievably hot in the summer, like standing in front of a hairdryer, and then the wind changes direction and the temperature can drop 10 degrees in 5 minutes. Romance novels are not too hard to find here, although they are quite a bit more expensive than the US. When I lived in Ireland and the UK I pretty much relied on Amazon as book shops, apart from Borders, tended not to stock them, or if they did they had a very limited range. The bookshops here in Australia are have a hard time of it at the moment, and quite a few (including Borders) have closed down. Most of the problem is because they are so expensive and people are buying on line instead of in the shops. One of life's little ironies is that I miss our local Borders, which was less than a block from my office. And yet, I was furious when B&N and Borders came to town, because our lovely independent bookshops all closed. I try whenever possible to buy from Powell's when I buy on line. I'll be in Seattle and Portland in January -- coffee and Powell's all in one go! I'm probably in the minority in disliking Starbucks coffee. I think they're going for a rich Italian brew, but to me, it tastes as though they burn the beans. I know books are expensive in Australia, though I admit I don't understand quite why. They're expensive her in Paris too. I'm beginning to feel quite lucky at book prices in the US. I'm going to be un-American and say that the best coffee in the world is Parisian. Or maybe Viennese. Or ... ok. Someplace in Europe. Though there's some great coffee in San Francisco too. Hmmm ... and there are all those places I've never been, just turning out great coffee. Maybe I shouldn't try to pin down the winner just yet. Bookshops seem to be having a devil of a time. they're trying to diversify into gifty stuff and games. They might do better to install a manga cafe. Thanks, for sharing some interesting places to visit with great information. Thanks. I would make a strong case for Rome as the home of the best coffee in the world. Wee delicious cappuccinos for 1 euro 60 at most. So good. The Toronto Public Library allows coffee and food on the principle that, well, we can't stop people from eating and drinking and taking baths with our books when they take them home, now can we, so why fight the odd coffee in the library? Very civilized. They don't sell it there yet (maybe at the reference library, I haven't been lately) but I have hopes. I have not spent a lot of time in Rome. I've been to Italy a bit, but I was mostly in the Northern Parts around Pisa and Florence.